Texto en inglés. 32 x 29. Tapa dura con sobrecubierta de editorial ilustrada. Como nuevo. It may be true that defense wins championships, but it's quarterbacks who put their stamp on the NFL like no one else. The Mount Rushmore of the position would have to be a many-headed hydra to honor them all: preternaturally poised Joe Montana and gunslinging Brett Favre, cerebral Peyton Manning and athletic Steve Young, shaggy Joe Namath and crewcut Johnny Unitas, black-and-white pioneer Sammy Baugh and his high-def descendants, Tom Brady, Drew Brees and perhaps someday, Russell Wilson and Andrew Luck. 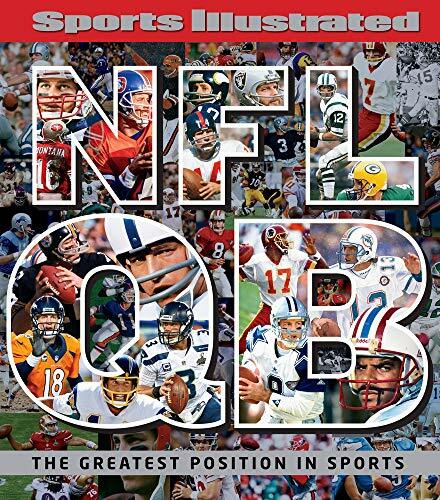 Sports Illustrated celebrates these iconic figures and many more in a pro football compendium unlike any ever assembled. NFL QB examines every aspect of this storied position through original essays, classic prose from the magazine's rich archives and insights from Hall of Fame players, all set against the most striking photographs ever taken on the subject. Every record holder is represented and reevaluated. The big arms, the elusive scramblers, the two-minute magicians, the crossover cultural stars, even the notorious flameouts, are all showcased. This comprehensive tribute to the game's most essential position is a must-have for any NFL fan. It may be true that defense wins championships, but it's quarterbacks who put their stamp on the NFL like no one else. The Mount Rushmore of the position would have to be a many-headed hydra to honor them all: preternaturally poised Joe Montana and gunslinging Brett Favre; cerebral Peyton Manning and athletic Steve Young; shaggy Joe Namath and crewcut Johnny Unitas; black-and-white pioneer Sammy Baugh and his high-def descendants, Tom Brady, Drew Brees and perhaps someday, Russell Wilson and Andrew Luck. Sports Illustrated celebrates these iconic figures and many more in a pro football compendium unlike any ever assembled. NFL QB examines every aspect of this storied position through original essays, classic prose from the magazine's rich archives and insights from Hall of Fame players, all set against the most striking photographs ever taken on the subject. Every record holder is represented and reevaluated. The big arms, the elusive scramblers, the two-minute magicians, the crossover cultural stars, even the notorious flameouts, are all showcased. This comprehensive tribute to the game's most essential position is a must-have for any NFL fan. Sports Illustrated (SI), the most respected voice in sports journalism, is a multimedia sports brand that takes the consumer into the heart and soul of sports. It reaches a weekly audience of nearly 21 million adults, and SI.com, the magazine's 24/7 sports news website delivers more than 150 original stories each week.